Caption: NYSUT women made their voices heard at events in Albany and across the state on the first anniversary of the Women's March. Photo by Becky Miller. We marched in Albany and Utica. We marched in New York City and Glens Falls. We rallied in Buffalo, the Adirondacks and Seneca Falls. On the first anniversary of the ground-breaking Women’s Marches of 2017 this past weekend, NYSUT members raised their voices in solidarity at events statewide, speaking out against injustice, and reaffirming the strength of women, the labor movement and the power of an engaged and informed electorate. 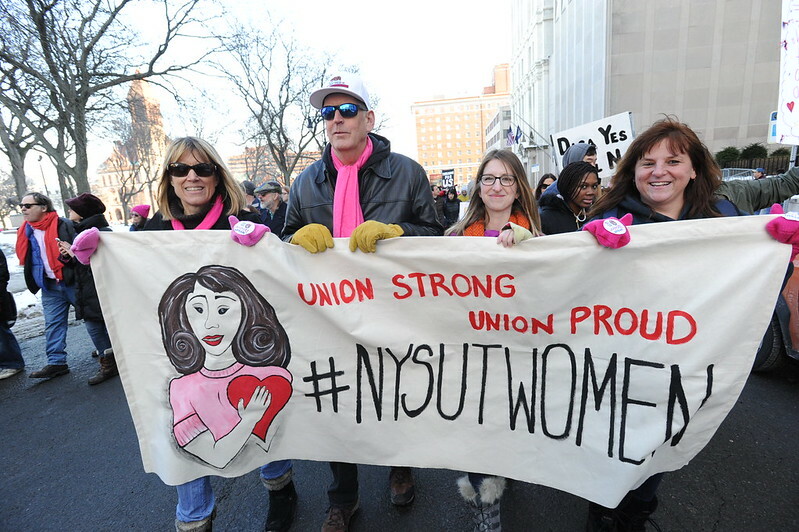 Members of the NYSUT Women’s Committee planning group sewed and distributed to Albany marchers pink, fleece gloves featuring the committee logo and the words “Union Proud, Union Strong.” A hand-painted, canvas banner, similarly emblazoned, further marked the group’s participation. Meg Sapia, a teaching assistant and Niskayuna Educational Support Personnel Association member, attended the Boston women’s march last year and felt marching again in Albany was important. “Environmental regulations have been turned back and I believe they’re important to defend,” said Sapia, who also supports a more welcoming immigration policy and felt the recently passed federal tax bill favored the rich. Women’s marches took place in 10 New York State communities this past weekend. Visit the links below to view your tweets and photos from many of the events.